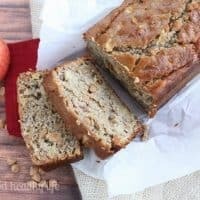 This Peanut Butter Apple Banana Bread is the most comforting way to use all those fall apples this year. Funny things happen when you send your spouse to the store. You have a recipe in your mind. The flavors are dead-set in your head. You just need el spouso to stop on the way home from work and grab the ingredients so you can make magic happen in the kitchen so said magic can end up in your mouth! So there you are. All day just day-dreaming about these flavors. You can pretty much taste them. And then the unthinkable happens. It all goes wrong. But in an amazing kind of way. So these flavors I was day dreaming about. Apples and Butterscotch. One of my favorite fall-flavor combinations. Seriously, how can you go wrong here? 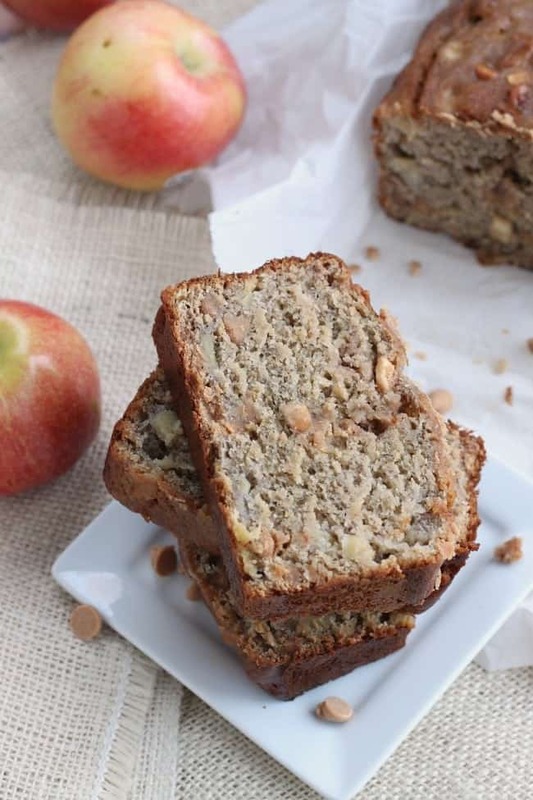 I made it happen with this popcorn mixture, and I wanted to see it recreated in banana bread. I saw no problem in sending the wifey to the local grocery store to cure my cravings. The only problem? We buy our baking chips in bulk. I know, that doesn’t sound like a problem. So here I am mixing along. In go the apples. In go what I think are butterscotch chips. Give it a good mix, and then a swipe of a finger. Wifey follows suite. Frustrated for about half a second that I wasn’t going to get my apple+butterscotch fix, but it totally turned into gratitude that it all still worked out into something fantastically delicious! 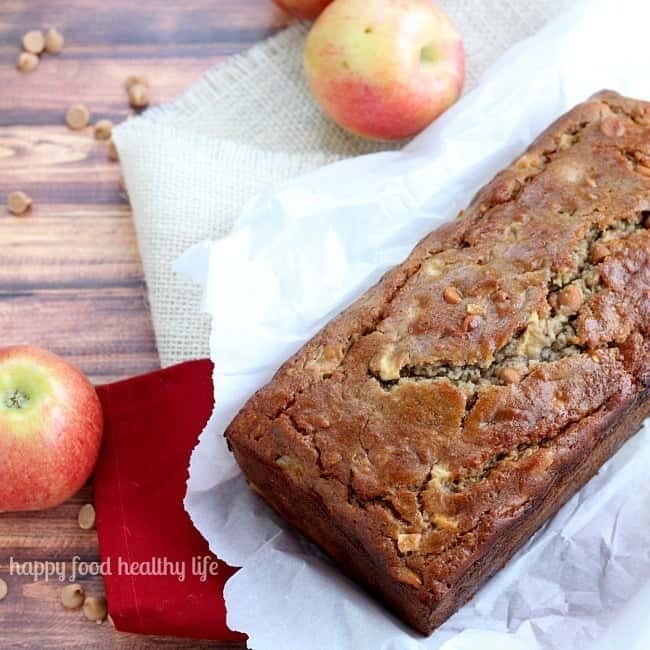 Stir together 1/2 cup granulated sugar, 1/2 cup brown sugar, 1/3 cup applesauce, and 1 Tablespoon oil. Set aside. Add 3 bananas, 2 eggs, 1/3 cup milk, 1/2 teaspoon salt, and 1 teaspoon baking soda to a blender and blend until smooth. Pour half the banana mixture into the sugar mixture with 1 cup of all purpose flour. Stir until just incorporated, then add the remaining banana mixture and 1 cup whole wheat flour. Mix until just incorporated. Stir in diced apples and peanut butter chips. Pour into prepared pan. Bake for 45-55 minutes until a toothpick comes out clean. Cool completely before removing loaf from pan. LOL! What a great….mistake…? Nah, even if it wasn’t the plan, I’m sure it tastes amazing! Love the idea of this combo! Yum! seriously! 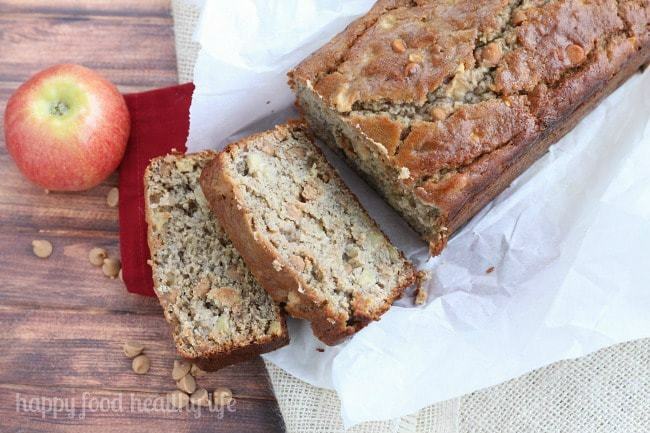 who doesn’t love apples and peanut butter??! 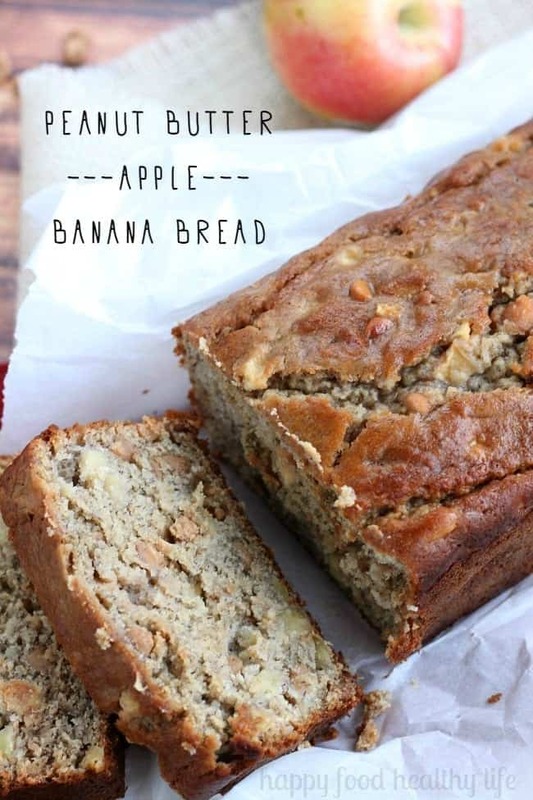 I just pinned so I can bake this soon with my son – how delicious! Thanks for sharing your recipe. I bet your son will love helping.. and sneaking peanut butter chips! Yum! Looks so good! What would you substitute for the coconut oil for someone with some coconut allergies? Would you trade it for another oil or just go for straight up margarine? I’m also trying to figure out if I could make this work in the breadmaker…. As for oil, use a vegetable oil instead of coconut oil. Same amount. Enjoy! I can’t find peanut butter chips in my country 🙁 can I use the normal peanut butter ? thanks!